But man has free choice, and therefore uses the ego to others’ harm. Such is the software from which we are built. We constantly examine ourselves in relation to others—if we are worse or better off they are. This is how human nature constantly operates us with the thought, “How can I benefit myself or harm others?” One who does not see it is unaware of this law. The Torah indicates and explains how to correct ourselves, how to transform us from a form that is the opposite of the form of the Creator, and into a corrected and complete form. This is why we cannot see the upper worlds, the upper force, the eternity and perfection we are in, and which is hidden from us. We can only see a tiny sphere known as “this world.” In this world there is nothing but a set time in which we exist, then leave, just like animals. We incarnate from above, descending from the upper world and back up, unaware of the rest of the stages in our development. The Torah tells us how we can correct ourselves so we may begin to discover ourselves in our eternal and complete form. The Torah shows us how we should work in order to discover the eternal, perfect world, and exit the sensation of exile we are in, toward a good and enlightened world. The two portions indicate all the corrections we must do. Tazria and Metzorah detail how one can correct the egoistic, corrupt signs we constantly discover in ourselves. It is written in Tazria that birth is a good thing, a new degree. The one who can deliver is the desire that craves birth, in order to turn itself to bestowal. When that desire can deliver from the woman the male part in her, all the surpluses of the will to receive that cannot be corrected are secreted as birth-blood, impure blood. At that time a person is called a “woman,” though it may well be a man. It depends on whether one is in a state of reception or bestowal. If a person delivers out of oneself an act of bestowal, that person is called a “woman,” who delivers a child. Then a person is told what to do with all that did not come out in this act, called a “newborn.” Thus, those desires that he or she used but which still could not be corrected come out as blood, as various secretions, as it happens in a physical birth. After some time these desires return and become corrected on higher degrees. Accordingly, after delivering a boy we undergo seven days of Tuma’a (impurity), a circumcision on the eighth, and the thirty-three days of purification. After delivering a girl we undergo sixty-six days of purification. These are special corrections. Once we have corrected these desires through a special act called Korban (sacrifice/offering), we perform an act in order to bestow in which we sacrifice, meaning bring ourselves closer to bestowal upon the Creator, according to the law of equivalence of form in order to become more similar to the Creator. This is how we progress another step in the correction. Here the corrections are in the tiny revelations of all the forms of the egoistic desire, which appears through leprosy, and through other problems that encounter us in our homes and our animals, namely in all the degrees, meaning desires of still, vegetative, and animate. The portion, Metzorah, details the corrections performed by the priest. We begin to discern forces in our inner structure that help us from experience—from previous corrections—to correct ourselves in all the qualities that appear as bad. The portion speaks of a man who brings himself or his wife to the priest. The portion details how to correct the “dresses” over the soul, which are called “garments.” The clothing is called Ohr Hozer (Reflected Light) or Ohr Hassadim (light of mercy), meaning an intention to bestow. Although we are born with egoistic desires, if we “clothe” them with the aim to bestow and want to perform acts of bestowal, we will thus correct our “garments.” The highest degree in this correction is to clean the clothes and show them to the priest for his examination. This is the meaning of the relation between the degrees in the upper system. We are constantly developing and discovering the world. We feel more and more included in something eternal and complete. A person lives in this world as an animate body, yet discover the eternal part within, which is called the “soul.” We identify with that part because it is much greater and more powerful than the animate part. That sympathy causes us to feel that our animate part is like a domesticated animal we keep in the yard, and it makes no difference whether it is dead or alive because the self, the human we have raised within, which we have built in similarity with the Creator, is as eternal and complete as Him. All this is done through work by which we discover all that is still not “clean” in us. We clean ourselves from all the ill thoughts and intentions, which aim for our own benefit and to others’ detriment. With each correction and cleansing we become increasingly similar to the Creator. The two portions are connected. One speaks of a quality called “woman,” and the other of a leper. What is a woman? What is a leper? And what is the connection between them? Within us is a special force that “paints” an image in the back of our minds, in our awareness and consciousness, that there is a world before us, outside of us. But if our senses suddenly stop working we will not perceive any world. If one of our senses disappeared, such as sight or hearing, part of our perception would disappear as well. The world is a product of our senses, which depict within us a certain reality. That reality has nothing to do with what is actually happening outside. If we study animals that live near us we will find that they perceive our world very differently. A dog’s world, for example, is full of scents. Dogs perceive the world through their sense of smell. They have no problem discerning things using that sense. Snakes perceive their world through temperature, distinguishing each element with great accuracy. 97% of the perception of our world depends on our vision. Thus, each one has a different picture of reality, but it is still a picture of reality. We attain the true perception through all those corrections that appear in the portions before us, when we correct our desires into having the intention to bestow more and more. If we use our desires with the aim to receive, we constantly absorb everything our tiny and limited tools of perception depict for us. But when we come out of ourselves into the endless frequencies beyond those of our eyes and ears, whose range is very limited, we enter the sense called “in order to bestow,” the “sense of giving and love.” In that state we find an unbounded reality, as though we have emerged from our skin, as it is written, “After my skin they lifted it” (Job, 19:26). Then the reality we begin to see is not limited to the five physical senses, but is the actual reality, the upper world that the Torah describes. In that new sense, what is a woman who delivers, and what is a leper? A woman who delivers is a correction of one of the senses, thus achieving new attainment, new bestowal, in which we discover another new world. Yet, we cannot use these forces for correction in order to bestow, a limitation formed by the contrast in it. We perceive everything through opposites. As creatures, we always see one thing opposite another. When we have only one color, or something without an opposite, or something for which we have no scale by which to measure or compare, we cannot see or feel it. If there is no black and white situation, we cannot see black, white, or yellow. The revelation of our correction is always under limitations. The boundary gives us a sense of orientation, that we are in something, gripping something. Otherwise we have no idea what is permitted and what is forbidden. In that state everything is completely amorphous and our sensations disappear. The woman is the one who gives birth. The Creator could have created a man who can give birth; why did He create only women with the ability to give birth? 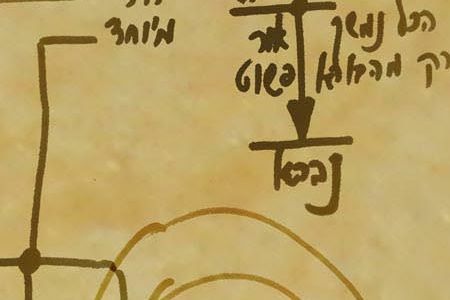 In Baal HaSulam’s book, The Study of the Ten Sephirot, as in the whole of the wisdom of Kabbalah, we learn about this form, in which we grow and put ourselves by ourselves into a complicated situation, the upper womb—a situation in which we can grow. We are assisting our growth inside the womb. It is great work that we do in order to adapt ourselves to the degree of the Creator until we are similar to Him, and then we are born. However, each of us has a personal reality, the stage of adulthood, opposite the stage of Katnut (infancy). The rest of the stages continue until we achieve the complete level. So a woman symbolizes the will to receive and a man symbolizes the desire to bestow? Are matters arranged from above in a way that the will to receive is the only one that can deliver, while the man, who is bestowal, cannot? The man provides the future form of bestowal. Were it not for the force of bestowal, the woman would not be able to deliver. If there is no expansion to the will to receive itself through the force of bestowal, it will not be able to give birth to anything. The portion, Metzorah, deals with skin infections. Why specifically the skin, there are many other afflictions? The skin is our place of scrutiny. Our desires consist of five degrees: Mocha (marrow), Atzamot (bones), Gidin (tendons), Bassar (flesh), and Or (skin). The Or desire contains seven layers; it is the final, crudest desire. This is why it is where we scrutinize our egoistic intentions, our ability to correct, and how. We correct a part of the skin by writing a book of Torah on leather. There is a parchment of leather that we cut in the middle, and write the letters of the book of Torah on the outer part. We separate the part that cannot be corrected. This part will be corrected only at the end of correction, when there are no limitations and no letters. The actual revelation of the Creator is on the last, most egoistic degree that can be corrected. Does leprosy symbolize inappropriate use of this concept? The Torah is dealing with a disease that is still today incurable. All skin diseases are hard to cure. We suffer from them our whole life. It happens because the skin is the last degree of the body, so it is very difficult for us to influence it. We treat it as the ending of the body, an outer cover of our internal organs, but the skin is just like the heart, lungs, and kidneys. It is an organ in and of itself, which we have yet to comprehend. When we weigh the skin we find it is the heaviest organ in the body. Also, we cannot live without it. True. We can see it with the problems that people who suffered serious burns have. It is an offshoot of spirituality, where the corrections on this degree are the hardest. It is Malchut at its conclusion. Is the skin “curable” or is it a chronic disease? Only at the end of correction, when we have corrected everything, will we be able to correct the skin, as well. Then the light will shine in Aleph through the whole structure known as Adam, as well as inside the skin, in the letter Ayin. “He took for the purification two live, pure birds, and a cedar tree, and scarlet, and hyssop.” One who engages in the work of one’s master and engages in the Torah, the Creator is over him and the Shechina (Divinity) connects with him. When one comes to be defiled, the Shechina departs from him, the Creator departs from him, and all the side of Kedusha (holiness) of his master departs from him. Then the spirit of Tuma’a (impurity) and the whole side of Tuma’a are on him. If he comes to be purified; he is aided. Once he has purified and repented, what has departed him returns to him, and the Creator and His Shechina are on him. This concerns a person who has come to be purified. The person brings two different birds, as well as part of a tree, through certain people. This is how we correct through our own forces, the desires that appear on the road to correction. Such people must discover the desires that require correction and correct them. Babylonian Talmud, Masechet Berachot, 17a. Babylonian Talmud, Masechet Nezikin, Baba Batra, 10b; Babylonian Talmud, Masechet Pesachim, 50a.